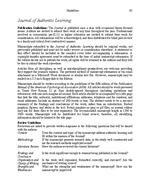 Invitation to submit manuscripts for the second volume of the Journal of Authentic Learning, Guidelines for publication ..
Made available in DSpace on 2005-05-20T21:15:14Z (GMT). Copyright A greement 64 Copyright Transfer Agreemen t Journal of Authentic Learning Author: _______________________________________________________________ Date: ___________________________ The following are the terms and conditions of this Copyright Transfer Agreement (Agreement) between the above-named Author and the Department of Curriculum and Instruction 102 Swetman Hall, State University of New York at Oswego, Oswego, New York 13126. The effective date of this Agreement is the date on which the Manuscript is received by The Department of Curriculum and Instruction. 1. The Manuscript and Rights to the Manuscript. Aut hor is the author of the manuscript entitled, _____________________________________________________________________________________________________ which is original to Author and has not been previously published or offered for publication For purposes of this Agreement, Author holds all copyright rights to the Manuscript (except as noted in this paragraph) and can transfer all rights, title and interest to the Department of Curriculum and Instruction as set forth herein. If Author prepared the Manuscript as a governmental employee, then Author shall notify the Department of Curriculum and Instruction of that fact. The Department of Curriculum and Instruction acknowledges that Authors rights may be limited by such employment. If Author is a co-author or if the Manuscript was prepared on the basis of a work for hire agreement, then Author has secured any third party permission necessary to effectuate this Agreement. Author agrees to provide such third party a copy of this Agreement. 2. Consideration; Transfer of Copyright. Author wishes the Depa rtment of Curriculum and Instruction to consider the Manuscript for publication by the Department of Curriculum and Instruction in the Journal of Authentic Learning In consideration for such review, upon receipt by the Department of Curriculum and Instruction, Author hereby transfers to the Department of Curriculum and Instruction all copyright rights in and to the Manuscript, including but not limited to the rights of first publication and republication, reproduction, public distribution and performance, and preparation of derivative and edited versions, in any med ia now existing or hereafter created throughout the world (the Trans fer). Author understands that the Department of Curriculum and Instruction is under no obligation to publish the Manuscript, but may do in its sole discretion. The Department of Curricul um and Instruction shall provide Author with notice of publicat ion and Author shall receive credit as is customary. 3. Termination of Transfer. In the event that the Department of Curriculum and Instruction does not publish the Manuscript with in two (2) years of receipt noted above, then the Transfer shall be null and void and of no further effect. If the Department of Curriculum and Instruction decides not to publish the Manuscript and notifies the Author of this decision, then the Transfer sh all be null and void and of no further effect. If the Department of Curriculum and Instruction publishes the Manuscript within said two (2) years, then the Transfer shall be irrevocable for the term of copyright. The Department of Curriculum and Instruction shall have the right to register the Manuscript in its own name with the United States Copyright Office. Author shall execute and deliver any documentation necessary to effectuate such registration. 4. Reservation of Rights of Author. Except for copyrights, Author reserves all other proprietary rights to the Manuscript and i n any ideas disclosed therein (including patent rights). Author shall be entitled to use all or part of the Manuscript in a future wo rk of his/her own (such as lectures, press rel eases, reviews or textbooks), provided that such use is after the Department of Curriculum and Instruction's first publication and that proper citation to the Journal of Authentic Learning (Examples: This article originally appeared in the Journal of Authentic Learning and date, Copyright "the Department of Curriculum and Instruction or This article contains material originally published in the Journal of Authentic Learning and date, Copyright the Department of Curriculum and Instruction) is provided. If Author desires to use the Manuscript prior to first publication by the Department of Curriculum and Instruction, then Author shall advise the Department of Curriculum and Instruction and obtain its consent, which shall not be unreasonably withheld. 5. Miscellaneous. This is the entire Agreement regarding the s ubject matter herein. This Agreement shall be interpreted pursuan t to the laws of the New York State. Author Signature _______________________________________________________________________________________ Department of Curriculum and Instruction Submit a signed copy of this agreemen t to one of the co-editors of the Journal of Authentic Learning when the manuscript is submitted for review.